As with any technology investment (whether it’s hardware, software, SaaS, DRaaS, HaaS or something else altogether), it’s critical to find the right fit for your company. If you don’t compare your options carefully, you could end up spending a lot more for solutions you don’t need, or worse: choosing insufficient technology that leaves your company at risk. What types of events threaten our data? Is the business at risk of a ransomware attack? What about on-site flooding or fire? Which kinds of protection are the highest priority? What solutions could ensure operational continuity after a disaster? What protections are needed to eliminate the risk of downtime? How much data do we need to back up? Are we talking terabytes of highly sensitive data, a thumb drive’s worth, or something in between? Will it be stored on-site, in the cloud or both? Storing data in the cloud, away from the physical business location, is a good precaution, but does it mean compromising recovery speed? What is our Recovery Time Objective (RTO)? How quickly would data need to be recovered in order to avert a major disruption in operation? What is our Recovery Point Objective (RPO)? How much data could we afford to lose if a backup needed to be restored? How recent does the recovery point need to be to meet that objective? Answering these questions can help to narrow your options. With more stringent requirements for disaster recovery, you’ll find that some Datto competitors fall short. Let’s take a closer look at the market to identify the differences between today’s various DR offerings. Veeam is arguably one of the top Datto competitors, offering a similar suite of products for data backup, cloud storage and recovery. Founded in 2006, the company is today known for its self-described “Always-On Enterprise” solutions, backed by its promise to help companies meet recovery time objectives of “less than 15 minutes for all applications and data.” They offer a variety of products, including both agent-based and agentless backups. Like Datto, Veeam offers image-based backups from screenshots, which enables a faster, more efficient backup process than other backup methods. But one difference right off the bat is that, with Datto, the backup image is a fully bootable virtual machine. This allows administrators to test-boost the backup to determine if the backup is recoverable. While Intronis was founded in 2003, the company was acquired by Barracuda in 2015. Thus, some of its data backup solutions integrate Barracuda hardware. It’s important to note that ECHOplatform, too, is marketed to MSPs, with the option of being “fully brandable.” So for example, if you’re working with an MSP that is offering its own branded data protection solutions, those solutions could in fact be the white-labeled Intronis ECHOplatform. ECHOplatform, released in 2015, makes Intronis a direct competitor of Datto, albeit one with much less experience in the hybrid-backup space. Mountain View-based Axcient has become another big player in BCDR, specializing in data backup and recovery for virtual IT environments. One significant difference between Datto and Axcient is that Axcient’s solutions are agentless, which means no software is installed on network devices. Axcient markets this as an advantage over Datto, claiming that it reduces load on primary systems. But truth be told, an agentless system will come with drawbacks in certain environments. Datto offers both agent-based and agentless systems, allowing companies to choose the solution that makes the most sense for their DR objectives and infrastructure. In a 2016 comparison, we also found that Axcient’s solutions stop creating new backup files after an emergency recovery has been performed. Our teams explained: “You could find yourself with no record of work performed since the crash,” which is especially dangerous if you’re replacing hardware and trying to restore systems after a disaster. In the event that you lose data again in those unstable moments following the initial disaster, you’ll have no backup to pull from. How quickly can backups be spun up (onsite and from the cloud)? What difficulties arise in more complex enterprise environments (dozens of servers, for example)? What kind of customer service can you expect, and from where (direct or via the MSP)? An important differentiation about Datto here is its “Inverse Chain Technology,” which eliminates the dependence on previous snapshots and makes each backup a fully bootable machine, as mentioned above. Datto also adds the peace of mind of screenshot verification, which tests the backup integrity and performs daily mock recoveries. In 2011, Datto announced it would begin using StorageCraft’s ShadowProtect technology within some of its own DR solutions, such as the Datto SIRIS, to enable ultra-fast recovery of image-based backups. Reviewers with experience on both Datto and StorageCraft have noted having more confidence in Datto’s solutions for total business continuity, while StorageCraft’s offerings left too many complex configurations on the shoulders of admins — creating a potential risk for small-business IT managers who don’t have as much experience building or managing sophisticated backup solutions. Keep in mind that Datto’s offerings span a wide scope of business continuity that goes beyond data backup and extends to file sync and share (FSS) as well. Datto Drive is a cloud-protected file-sharing platform specifically for businesses, with automatic backups and on-demand file recovery. In 2016, Datto made headlines by offering a free terabyte of FSS storage for a year, and then $10 a month thereafter – for an unlimited number of users. That pricing made Datto Drive a far better deal than other business-grade FSS offerings, including those from Dropbox, Box, Google and Microsoft. Those competing offerings charged up to $15 per month per user. That pricing effectively pushed out many small businesses. 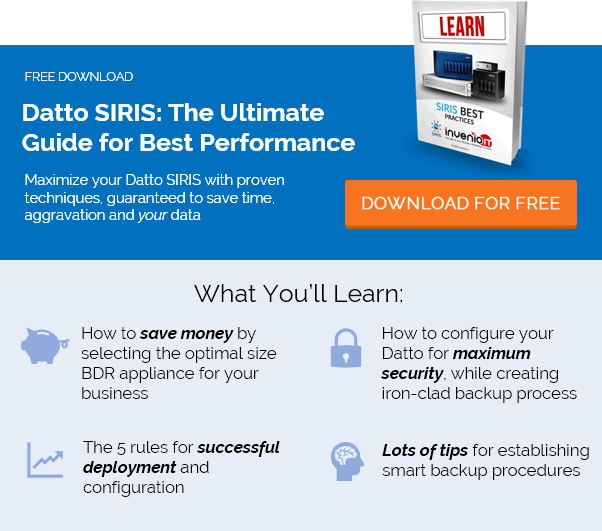 Datto Drive can be used on its own for FSS or deployed as “Datto Drive Local” within its other solutions, such as the SIRIS 3 appliance. For more information on how Datto compares to its competitors in business continuity, contact our experts at Invenio IT. Request a demo by calling (646) 395-1170, or email [email protected].